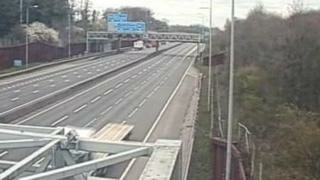 Two people have been seriously injured in a crash that closed the M25 for several hours. An elderly man and woman were taken to hospital following the crash at junction 20 for Kings Langley, Hertfordshire, at 11:55 GMT. The clockwise carriageway - where the crash involving a Citroen C3, a Nissan Qashqai and a lorry took place - was closed from junction 19 for Watford. Hertfordshire Police fully reopened the motorway at about 20:30 GMT.